Violinist Miroslav Hristov was hailed by Fanfare Magazine for his “razor sharp technique” and a “full palette of tonal colors.” He presents master classes and performs extensively throughout the United States, Europe and Latin America. As a soloist and chamber musician, he has performed in several international festivals and concert series, including the Musical Treasures series in Carnegie Hall, the Interharmony International Music Festival in Arcidosso, Italy, the Sofia Music Weeks International Festival, The Balabanov House Music Days, and the Big Arts Concert Series in Florida. Dr. Hristov was First Prize winner of the International Violin Competition “Dobrin Petkov,” and a prizewinner for the MTNA Collegiate String Performance Competition. Dr. Hristov has recorded for Centaur Records, Romeo Records, the Divine Arts Record label, Bulgarian National Radio and WUOT Knoxville. His recordings are broadcast on NPR stations across the country. As part of the internationally-acclaimed Kaleidos Duo with pianist, Vladimir Valjarevic, Dr. Hristov’s recordings and performances have received rave reviews from The Strad Magazine, Fanfare, DUMA (Sofia, Bulgaria), and Lucid Culture (New York). 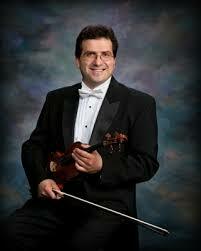 As Associate Professor of Violin at the University of Tennessee School of Music, Dr. Hristov is Founder and Co-Director of the University of Tennessee School of Music’s Annual Violin Festival where over 100 participants gather to attend lectures, master classes, and perform alongside world-renowned guest artists. Previously, he taught violin in the Universidad Autonoma de Nuevo Leon in Monterrey, Mexico where he served as Principal Second Violin of the Orquesta de Camara de Monterrey and the Orquesta Sinfonica de la Universidad de Nuevo Leon. Dr. Hristov has presented his research on Eastern European pedagogical methods for violin at conferences around the world, including the International College Music Society Conference in Dubrovnik, Croatia, the American String Teachers Association National Conference, as well as several regional and statewide clinics and conferences. A dedicated teacher, his students have won numerous competitions, and many hold prestigious scholarships and professional appointments. Recent teaching awards include the 2014 Tennessee Music Teachers Association Teacher of the Year, the Tennessee Governor’s School for the Arts Outstanding Teacher Award, and the University of Tennessee School of Music’s Faculty Distinguished Teaching Award. Dr. Miroslav Hristov is also Founder and Director of the University of Tennessee’s Ready for the World Music Series, which brings renowned artists to perform and talk about musical styles and literature from diverse regions around the world, emphasizing each region’s contribution to western classical music.